Are you looking for easy to use way manage Ipod contents? Froddle Pod is free and feature rich manager program for Windows computer. Besides viewing files on the Ipod, you can easily transfer files between PC and Ipod device. It also support other advance features like backup, sync, restore, ripping and many more. 1. Copy music, video files to – from Ipod and PC or any other storage. 2. Synchronize iPod with a folder Backup everything on your iPod. 4. Restore a previous backup Delete media from your iPod. 5. Support wav to Mp3 conversion for IPod transfer. 6. Also supports Music normalization for same music volume. 7. Play audio, video formats supported by the iPod (except quicktime format). 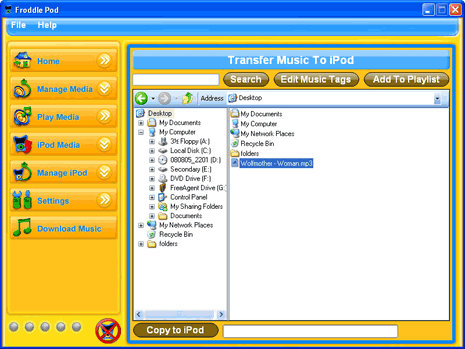 Download Froddle Pod for easy management of music and video files between iPod and Windows computer. Do more with your iPod data with ease. Froddle Pod is all free for download and use program.